Dario Franchitti has no doubts cousin and fellow Scotsman Paul di Resta will shine in Formula 1 this season. Di Resta joins fellow Britons Lewis Hamilton and Jenson Button on the grid for the forthcoming F1 campaign after landing a drive at Force India. "I'm confident he will do the job," said the three-time IndyCar champion. "Now he is there, he can build on foundations, improve the car, beat his team-mate, move up the grid, all of those things." Force India informed the 24-year-old just before Christmas he would be stepping up from his previous role as reserve driver. And double Indianapolis 500 winner Franchitti believes his relative has what it takes to not only come through his debut year but to push on for the future. "I was thrilled for him when I heard he had got the nod," said 37-year-old Franchitti. "I'm just really proud of him. He's worked hard for it, but in some ways the hard work now begins. "It's going to be hard work, but he has all the attributes to do it." Di Resta last season combined his reserve role with his duties in DTM (German touring cars) and provided himself with a successful platform as he took the title. 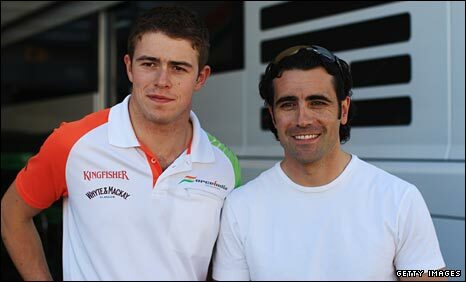 Asked what can be expected of Di Resta in F1, Franchitti replied: "He'll let his driving do the talking. "He has a tremendous amount of talent and he's a very smart guy, which is key to Formula 1. "Everybody in F1 has a gift to a certain degree, but he has an intelligence too - and determination. "I hope we're going to see him really get a chance to show what he has got."